Journalists secretly recording conversations will lead to mistrust and a Soviet-like fear of speaking to anyone, MK Yisrael Eichler warns. The saga of the security guard who secretly recorded the prime minister's son and then sold the recording to the media, continues to make waves in Israel, along with the clip of Sarah Netanyahu berating an aide ten years ago. Although the left tried to make an issue of Netanyahu's wife and son's behavior, what upset most of the public was the invasion of privacy and needless humiliation the prime minister's family suffered as a result. 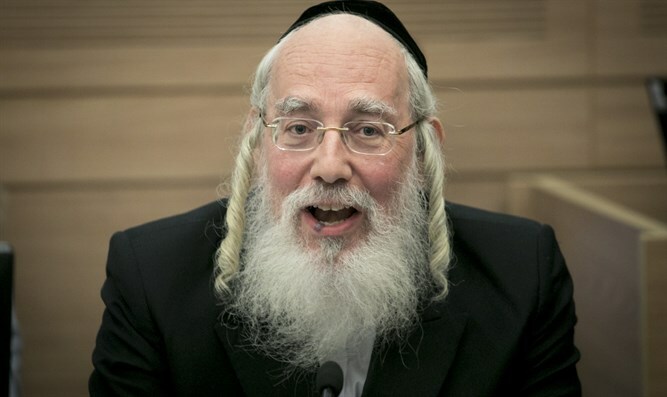 Haredi MK Yisrael Eichler (UTJ) on Tuesday slammed the trend of secretly recording conversations and said doing so "destroys ethical norms and disrupts the day to day work of Israeli Prime Minister Binyamin Netanyahu, Knesset Speaker Yuli Edelstein (Likud), and the other ministers." The prophet Habakkuk said, "'And stones will cry out from the walls, and the beams of the woodwork will echo it (ibid. 2:11).' We believe that 'there is an Eye that sees and an Ear that hears all (Ethics of the Fathers 2:1, referring to Gpd),' but I want to tell them what the train station in Russia looks like." "There are millions of people, more than in New York and London put together, and they are all standing silently, walking silently, no one dares to wish another well. There's an enormous fear that someone may be recording you. Maybe someone is watching you. There's fear. The KGB may be standing behind you and listening. All you can hear is the train approaching in the background, in complete contrast to the noise of the people you hear alighting from trains everywhere in the democratic world. "The basic fear that exists in their hearts from the days of the Soviet Union has not disappeared even though it is decades later. It's a paralyzing fear that freezes the entire country. That's what will happen in Israel: People will be afraid to speak, because the trend of secretly recording everything threatens the entire country's normal existence. "A person can be sitting in his room, surrounded by friends, family, or colleagues, and his subconscious will tell him not to trust them. Why? Because that's how people who record destroy human society. It can be the Prime Minister, it can be the Knesset speaker, a minister, or an MK. It can be professional legal or economic advisers, doctors, or family counselors. "And those people who betray their friends are called 'democracy's watchdogs,' while they act like the hunting dogs in a dictatorship run by legal advisers and clerks. Journalists spread slander and are the enemies of justice and ethics." Last week, Walla Hebrew-language website published a recording of Prime Minister Netanyahu's wife Sara screaming at a communications adviser over a newspaper article that did not mention that Sara works as a child psychologist. The incident in the recording occurred years ago. In response, PM Netanyahu issued a statement, asking, "Is there a person who never gets angry and says a few words he did not mean?" "Only in the case of my family is this made a leading news headline, and is used as platform to attack me in the ongoing effort to bring down my government through means other than elections.... The public is intelligent and understands very well what is really happening here."